Home» AP LATEST UPDATES | TS LATEST UPDATES » Jawahar Navodaya Vidyalayas Entrance Test For Admission to IXth Class Against Vacant Seats During 2016-17. 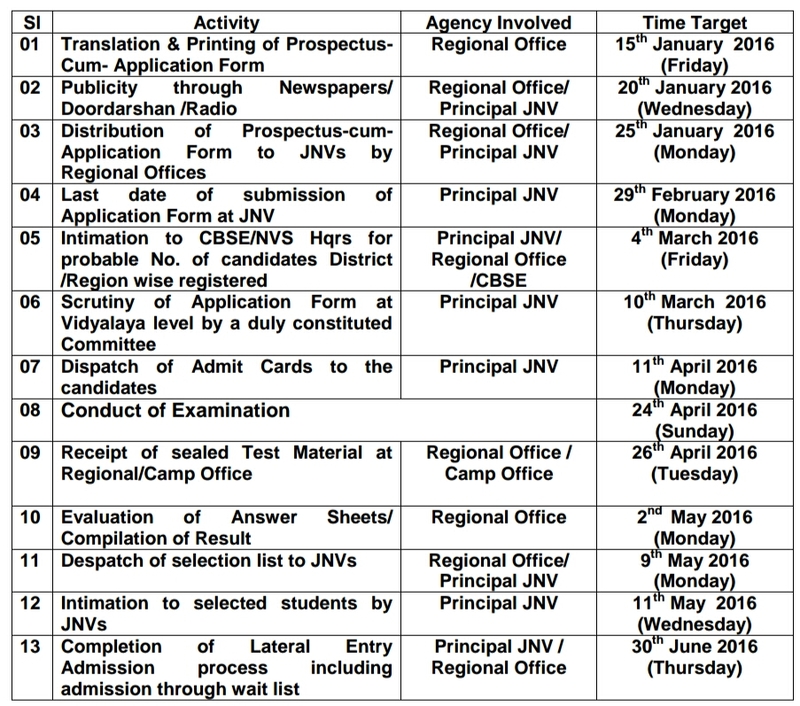 Jawahar Navodaya Vidyalayas Entrance Test For Admission to IXth Class Against Vacant Seats During 2016-17. 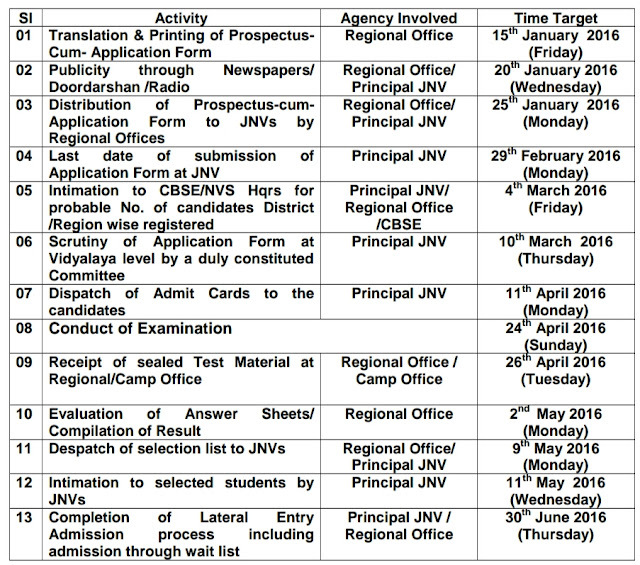 Jawahar Navodaya Vidyalayas (JNVS) Entrance Test For Admission to IXth Class Against Vacant Seats During 2016-17. As envisaged in National Policy of Education (NEP), 1986, Govt. of India set co-educational residential institutions named Jawahar Navodaya Vidyalayas in 28 States and 07 UTs excluding Tamil Nadu. At present, 598 such Vidyalayas have been sanctioned in the country. The main objective of these Vidyalayas is to provide quality modern education to the children predominantly from rural areas. Though the admission into these Vidyalayas is at Class VI , it is intended to fill vacant seats with a lateral entry test at Class IX level. concerned. The medium of test is English/Hindi. a) Only those candidates who have studied/is studying in class VIII during the Academic Session 2015-16 in one of the Govt./Govt. recognized schools of the district where the Jawahar Navodaya Vidyalaya is functioning and where admission is sought. b) Candidate appearing for the selection test must pass Class VIII in the academicsession 2015-16 from a Govt./Govt. recognized school in the district where he/she is seeking admission. c) Candidates seeking admission must not have been born before 01.05.2000 and after 30.04.2004. This will apply to candidates of all categories including those belonging to SC/ST. d) Navodaya Vidyalaya Samiti reserves the right to refer any candidate to a MEDICAL BOARD for confirmation of the age of the candidate in case a doubt arises about the age certificate produced by the candidate before the admission is given. Nature of the Selection Test. website http://www.nvshq.org Neatly typed and Xeroxed copy of the applications also can be used for applying. Navodaya Vidyalaya of the concerned district by Monday the 29th February 2016 either through Registered Post or in person. spread over 28 States and 07 UTs. www.nvshq.org / Regional Office’s Website. Application Form duly completed in all respect must reach the Office of the Principal, Jawahar Navodaya Vidyalaya of the concerned district on or before Monday the 29th February 2016 Duly filled in application forms must be sent through registered post A/D. If the candidate prefers to submit Application Form in person, he/she is advised to get the acknowledgement from the office of the Principal of Jawahar Navodaya Vidyalaya. Monday, the 18th April 2016, he/she must contact the office of the Principal of Jawahar Navodaya Vidyalaya for obtaining the same. 2016 in Jawahar Navodaya Vidyalaya of concerned district. 1. Only those candidates who have studied/ is studying in Class VIII during the Academic Session 2015-16 in one of the Govt./Govt. recognized schools of the district where the Jawahar Navodaya Vidyalaya is functioning and where admission is sought. 2. Candidate appearing for the selection test must pass Class VIII in the academic session2015-16 from a Govt./Govt. recognized school in the district where he/she is seeking admission. 3. Candidates seeking admission must not have been born before 01.05.2000 and after 30.04.2004. This will apply to candidates of all categories including those belonging to SC/ST. 4. Navodaya Vidyalaya Samiti reserves the right to refer any candidate to MEDICAL BOARD for confirmation of the age of the candidate in case a doubt regarding age certificate produced by the candidate before the admission is given. 1.Selection in the selection test will not vest any right upon candidate to secure admission into JNV till the candidate produces all the relevant certificates such as date of birth, pass certificate of VIII class with mark sheets, SC/ST certificate as prescribed by NVS for the admission. 2 Details of the marks obtained in the test are not communicated and there is no provision for re-checking/re-totaling. 3 Candidates will be considered for the admission only into that Vidyalaya for which he/she has appeared for Selection Test. 4 At the time of admission, candidates belonging to Scheduled Castes (SCs) Scheduled Tribes (STs) & Other Backward Classes (OBCs) categories will have to produce the required Scheduled Caste/Tribe or OBC Certificate issued by the competent authority. 5 In case of any dispute, the decision of NVS will be final and binding on the candidates. Medium of Language for Examination will be English/Hindi. Hindi. Difficulty level of the test paper shall be Class VIII. Time Activity Schedule for Conduct of Lateral Entry Test 2016 for Class IX during the Academic Year 2016-17.